My boy Peter Thomsen, an ace photographer and graphic designer, needs an iPhone. He submitted a video (shot and edited by your humble narrator) to Pantone’s Color Kill Contest. Have a look if you’re in need of a show-and-tell-ish mid-day diversion and then give it a star rating to get Peter his iPhone. ¶ It feels good to help people out, right? or: What Not To Call Your Presentation. I’m taking a schoolUpdated: my school is paying for my substitute and registration. Thanks a bunch. day today and driving 45 minutes South to Monterey, CA, for two-and-a-half days of math-instruction instruction. I’m pumped. This blog was born during Asilomar last year, y’know? I got into a conversation with this lady named Rebecca who was all crazy about blogs in the classroom and I was like, huh?, and she said, well you’ve heard of David Warlick, right?, and I was like, huh?, and the conversation kept up like that until the day that you and I first metWish I could find Rebecca’s blog now. She’s, like, medium build, shoulder-length hair, and, um, average height. Maybe one of you School 2.0 types knows her..
I’ve been looking forward to Asilomar 2007 ever since. This year you’ve got my favorite high school math teacher (Sid Bishop, Ukiah High School) and my favorite college math professor (Tom Sallee, UC Davis) conducting sessions back to back. Them boys are gonna bring the walls down. But excepting sure-bets like those, selecting breakout sessions is a delicate game. One can’t help leaning heavily on session titles. Who Should Take Algebra? And What If They’re Not Ready? 50 Years Since I’ve Taken Algebra 1. What’s Happened? Math 20-20 Vision: What Will K-8 Math Education Look Like In 2020“For the first time in 2,500 years, we have a medium ideally suited to teach basic math skills.” Suppose he’s talking about the phonograph? Or, basically, give a clear, targeted goal or issue a clear, intriguing question and I’m sold. Games And Tricks To Put The F-Word Back In Teaching — FUN!Oh man, I almost thought he was gonna go there. Eureka! Discover Gold! Integrate Math And History. LOGical Arithmetics: Fun, Insightful And As Easy As Falling Off A Log! The Ethnomathematics Of Dance!Oh man, this one hits all of my buttons. So, best to avoid cheap puns, promises of inspiration, uplift, exclamation points. But, I mean, don’t take any of this too prescriptively. I’m at sessions as much for presentation style as content so maybe you want to ward off ornery kids like me with a few exclamation points. No way I sleep all weekend. If you’re heading my way and want to meet up, get at me on my burner, or just keep an eye out for a tall dude, head tucked low, back of the room, scribbling all over a yellow legal pad. That’ll be me. A full dinner pail. Vote dy/dan best new edublog and best individual edublog. Tom couldn’t quit if he tried. Here is the fourth in a great set of rap-themed classroom posters and his first nod to the international scene. ¶ Upload these to Snapfish, okay? They’ll print you out a full-color wall poster for under $10. 25 photos taken at exactly the right moment, a set which is exactly what you think it is. Running From Camera, a German dude who sets his camera to a two-second timer and then sprints. If you’re gonna do any sort of long-term photo project, his set demonstrates the efficacy of a reference point. The dude’s blurry backside pins each photo down and lets your eyes wander off from there. The Morning After, an awesome historical document, not of the actual (blasé) aftermath of Y2K, but of the worst-case scenarios we were all running through our heads on 31 December 1999. 721 claps per minute, offering the quick, back-of-the-gum-wrapper calculation, how many claps is that per second? Keep cool with Coolidge. Vote dy/dan best new edublog and best individual edublog. 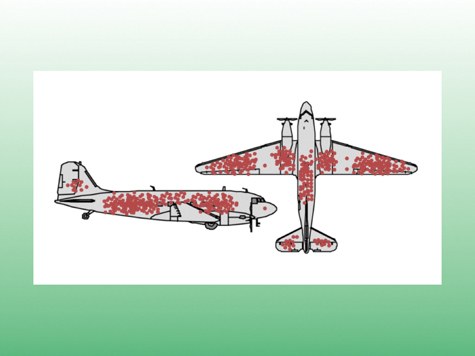 The story goes that during World War II, Allied pilots were taking a beating. There was a very limited supply of retrofitting armor at the time so the Allies hired a statistician to determine where and how they might best allocate it. You insert the question real quick and you turn your inflection up at the end like it’s just a quick set-up for the real question when in fact, nah, this is the only question. They walk right into it and tell you they’d attach the armor where all those dots are clustered. And I tell you: there isn’t any correlation between the age of the student and how long it takes her to figure out why. See, I first told that story last year. I happened upon it ’cause some friend linked to some other blogger who linked to it out of someone’s del.icio.us feed. Basically there was no way I’d ever find it again this year. I mean, maybe I’d remember the story but odds are slim I’d relocate that image again if not for the fact that my lightweight presentation files (a few megabytes per week) let me save every fun thing I’ve ever shared with my class. Forever. And now this year, the same friend links to kottke who links to waxy via boing boing who gives up some other cool thing to share with my class. And suddenly I’ve got two awesome thought-provocations to spread over two days. How long until I have 180 provocations for every day of the school year? No way to tell but given how happily my laptop and digital projector play together, I can only surmise: not very. Are you better off than you were four years ago? Vote dy/dan best new edublog and best individual edublog.